I’ve always imagined the 1920s to have been just one big party. The “war to end all wars” was over and things would continue to improve until the end of time. 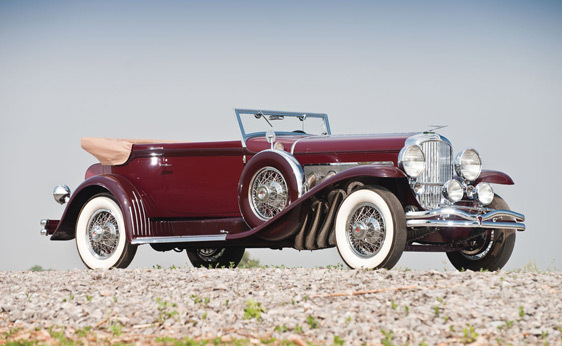 The Jazz Age, in full swing for some time, was reaching its zenith when the Model J Duesenberg was introduced. Unfortunately it would end almost immediately thereafter. If there is any single thing in my mind that defines the Jazz Age, it is George Gershwin’s “Rhapsody in Blue” – a near-perfect combination of classical music and jazz. Many people consider it one or the other but I happen to think it is the greatest example of both. This absolutely amazing piece of music was commissioned in 1924 by Paul Whiteman, a bandleader referred to in the media as “The King of Jazz.” His arrangement of “Rhapsody in Blue” for full orchestra is the definitive version this song. A shellac 78 record of Whiteman’s version is spinning across the room as I write this. So what does any of this have to do with this car? Well, this car was purchased new by Paul Whiteman with the original body being a LeBaron Sport Phaeton. Whiteman sold the car in 1932 and the new owner replaced the original body with the Convertible Victoria style by Rollston you see here, making it one of 16 Rollston Convertible Victorias built and one of 57 Rollston-bodied Duesenbergs in total. The new owner also had a supercharger installed, bumping horsepower from 265 to 320. This move also elevated this car into a whole new realm of collectability. When it comes to American cars, the SJ Duesenberg is exceeded in price by few and in desirability by even fewer. For me, this SJ (engine no. J272) would be the one to have because of its direct connection to the Jazz Age – an era like no other. If I had the means, this car would soon be in my garage – and while it’s no yellow Rolls-Royce, I would drive this thing around town like I was Jay Gatsby himself. The pre-sale estimate is $850,000-$1,200,000 – putting it just out of my reach. To read more about this car, click here. And to see more from RM at St. John’s, click here. This entry was posted in Uncategorized and tagged 1930, auctions, cars, classic, classic cars, convertible victoria, duesenberg, model J, model sj, rm auctions, rollston by classiccarweekly. Bookmark the permalink.